President Barack Obama is stacking his cabinet with what we might call "armchair Islamic theologians," men who claim to understand Islamic doctrine and who use their position to convince listeners that violence and terrorism have nothing to do with Islam. JERUSALEM (WND) – Terrorism is not a belief but instead is a response to despair and a lack of hope, argued Chuck Hagel in unreported remarks during a 2007 Senate hearing. “But when people have no hope, when there’s despair, little else matters,” said Hagel. Hagel was speaking at a Jan. 24, 2007, Senate Committee on Foreign Relations hearing on Iraq. Hagel’s views on terrorism are not abnormal for the Obama administration. Brennan is now Obama’s pick to head the CIA. Sahih Muslim 33—The Messenger of Allah said: I have been commanded to fight against people till they testify that there is no god but Allah, that Muhammad is the messenger of Allah, and they establish prayer, and pay Zakat and if they do it, their blood and property are guaranteed protection on my behalf except when justified by law, and their affairs rest with Allah. Lack of hope, he's right! Like the Holocaust! It had nothing to do with nazi indoctrination, German people simply suffered a lack of hope and perhaps also boredom! So spontaneously they all decided one day to kill Jews and Gypsies and Homosexuals and Handicapped People, etc!... Amazing, i'd never thought of that, but that's because i haven't had enough lack of hope! Where were the "despair" or "lack of hope" when Muslims were waging Jihad on Constantinople, Italy, Spain, Asia... etc? As a matter of fact, despair and lack of hope are the reasons why Jihad is not being waged as it should. Hagel is part of the Hamas operation called "The Project." 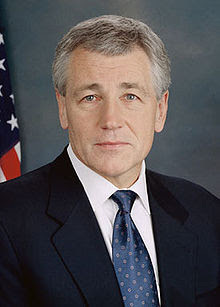 AH Hagel, yet another idiot in need of a place to go. Thanks Barack for providing a "Loser's Club" to keep them from being homeless. Muslims lack hope but not primarily for the reasons Hagel states. Islam twists morality and blasphemes G-d and the reasoning mind can't resolve the duel ethics or a G-d that deceives. The main reason is even the illiterate understands they can't possibly hope to hit the 50 percentile plus mark of good deeds (Good luck trying to come up with a formula to gauge compliance with a fickle G-dhead). The options are abandon the faith or the sure way to punch your ticket into Allah's abode of eternal orgasmic bliss is Jihad. Muslims, poor souls, have been messed with from birth by the Father of Lies and the barriers between them and a G-d that loves them unconditionally is great. Mention them in your prayers each and every day. I'm very sure that the 9/11 terrorists were feeling the joy of perfect faith in their perfect demon when they killed all those people. Terror is caused by despair? It's a futile, stupid attempt by those who have submitted to feel some power in themselves. If your will is taken away, then the only thing left is destruction. They say submission is the keynote of Islam. "Abandon hope, all ye who enter here," Dante's message for the gates of hell. Yes, he's right. Islamic terrorism is cause by lack of hope. How can any one stuck in that hateful, intolerant, evil, oppressive ideology have any hope? Look at the misery, death, destruction, poverty, and ignorance that it creates everywhere it becomes established. It can get by for awhile so long as it can feed off of the enslaved dhimi populations, but once they covert there is nothing left for the parasite to feed off of, and you're left with the third world hell holes that are the countries of the Muslim world. So, yes there is no hope in Islam, and Islam is the cause of the problem. Unfortunately, Hagel doesn't understand what causes the lack of hope.